These amazing braided hairstyles are all worthy winners of international hairstyles competitions. 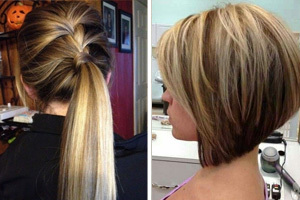 They are also super-trendy with fabulous new twists on high-fashion braid hairstyles and hair-colors. 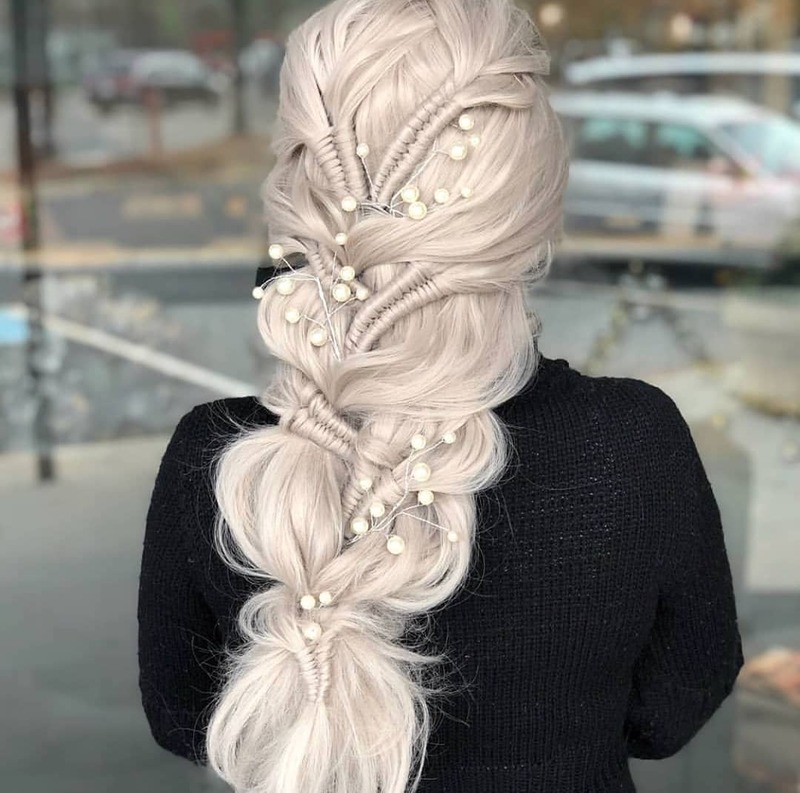 So if you need a stunning hairstyle for bridal wear or any special occasion, you’ll find a ton of inspiration in these amazing braided hairstyles! This is a truly stunning look that can be worn as a bridal hairdo for a semi-formal wedding. It creates several different strands of texture in the five vertical braids decorating the back. And the beautiful rose braiding on the crown is a real show-stopper! 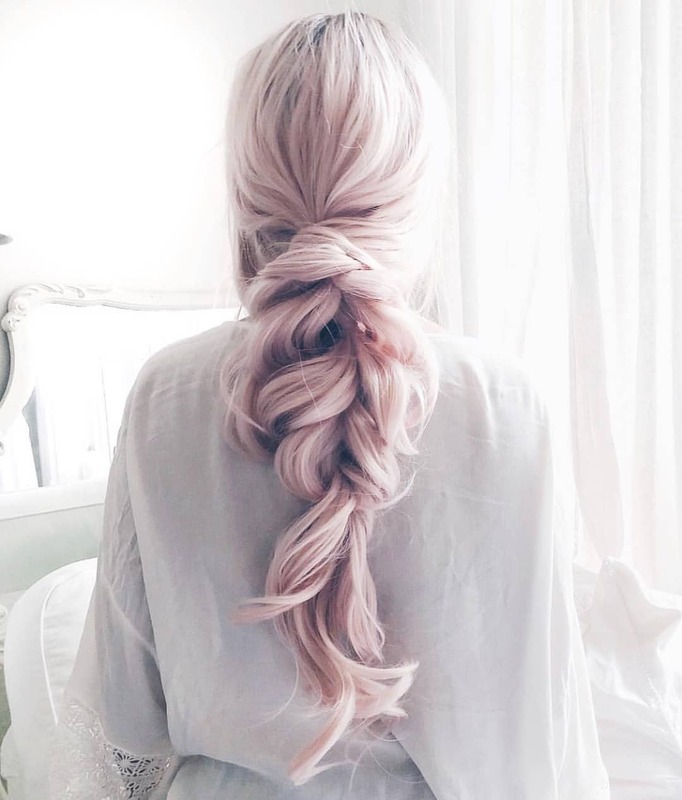 In trendy shades of beige-blonde, highlighted in copper, brown and pink tips – this is an unforgettable braided hairstyle. Here’s an edgy, super-modern braided hairstyle using giant braids to create fabulous a silhouette! 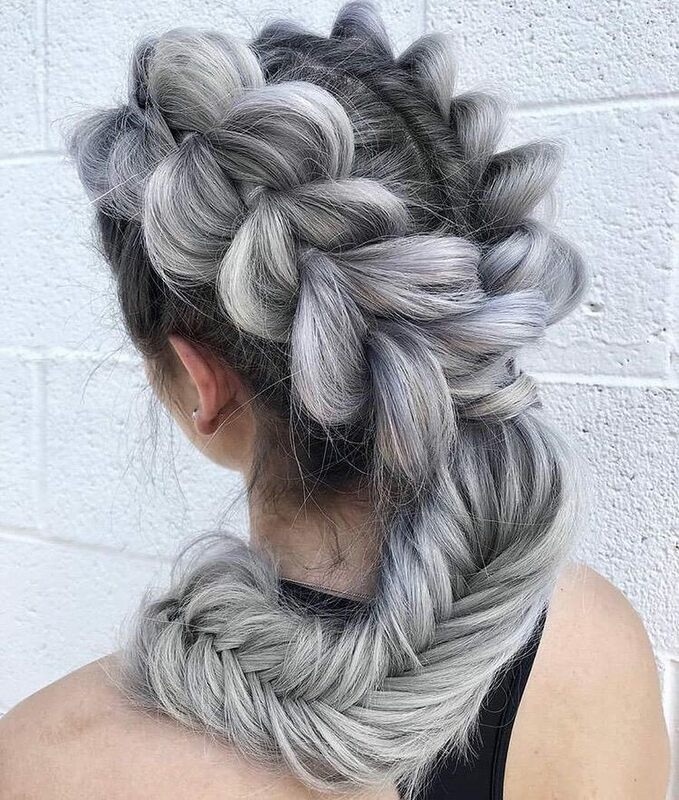 It’s a half-up style with split braids decorating the head showing off the 3-D effect of contrasting charcoal- and dove-gray hair-color. The fish-bone braid curls attractively around the neck and shoulder in another show-stopping, textured-braid hairstyle! 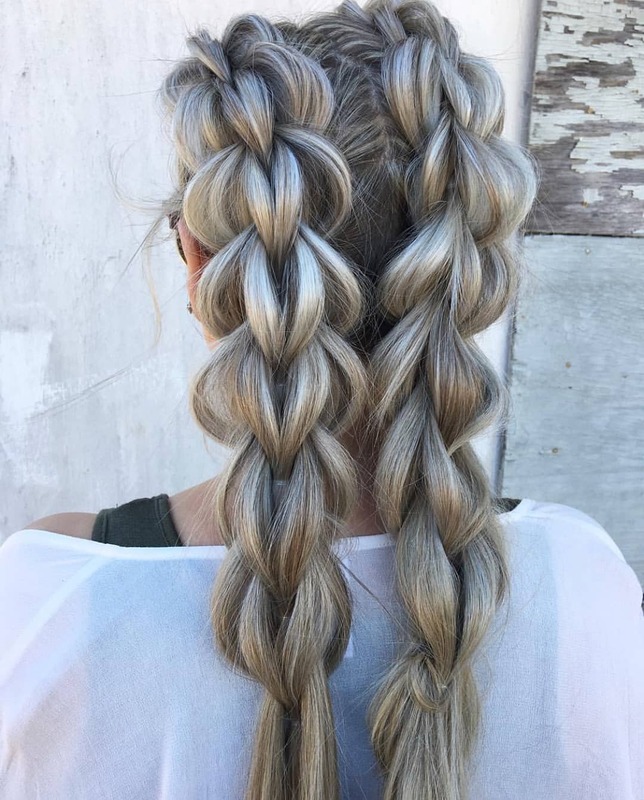 This new braiding technique has split chain-links that create a fantastic all-round volume! 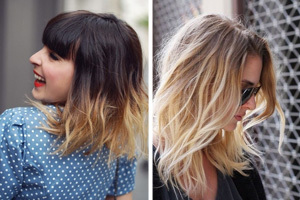 The expert colorist has carefully highlighted the links with white balayage to show the amazing texture and pattern. In ash-blonde with a pewter tone, this is an edgy and original new braided hairstyle with a trendy, casual finish. This full-on, artistic hairstyle is designed for brides or women attending a very swanky social event! 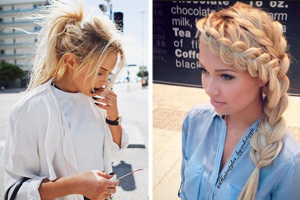 The overall style is a very loosely plaited braid. And this creates romantic waves draped down the back. Sections of the braid links are bound with hair strands, borrowing a traditional basket-weaving method. And pearly floral hair accessories complete a luxury look! 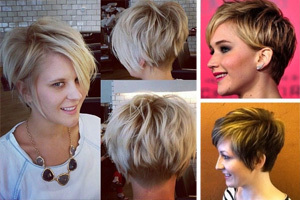 Show off your good taste and lovely long locks with a modern beige-blonde neutral hair-color design. 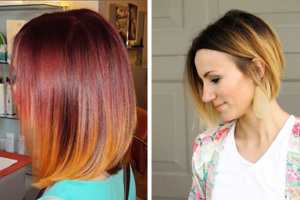 Dark-brown roots create a strong contrast with the beige ombré, and gold-blonde balayage. And this always gives hair a 3-D dimension making it seem even thicker. The cute top braid is original, adding flattering crown height and a pretty feature at the back, with a cute hair accessory. 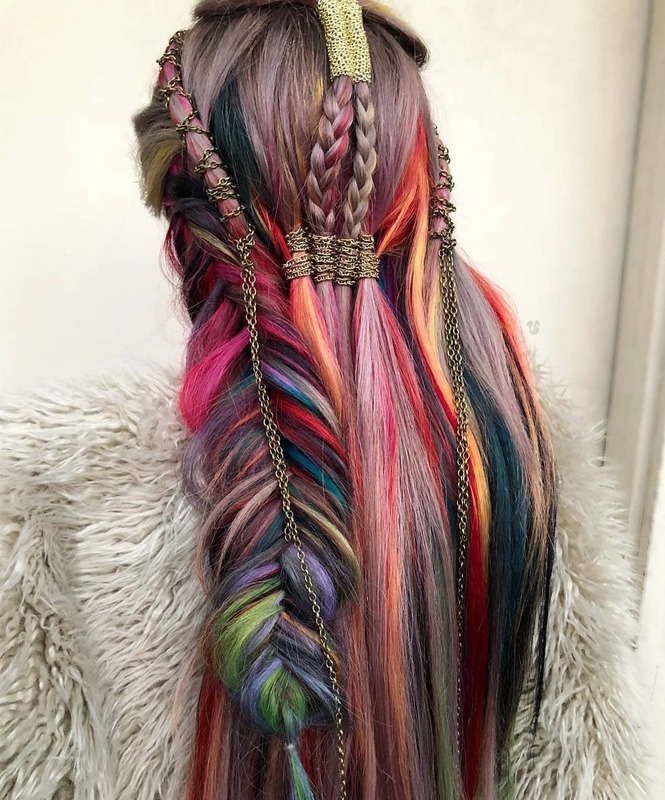 This asymmetrical braided hairstyle is a really expert and trendy use of fantasy hair-color. The dark roots create strong 3-D vibe beneath shades of mink-brown that move on to rainbow balayage. The fish-bone plait on one side is a truly artistic piece of braid balayage. And the antique-gold chain hair-accessories finish off a fantastic boho braid hairstyle! Indigo roots create a 3-D contrast that’s softer and more modern than black. 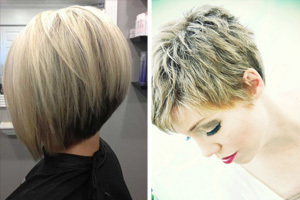 The overall theme is red, white and blue on wheat-blonde that’s softer than stark white-blonde. 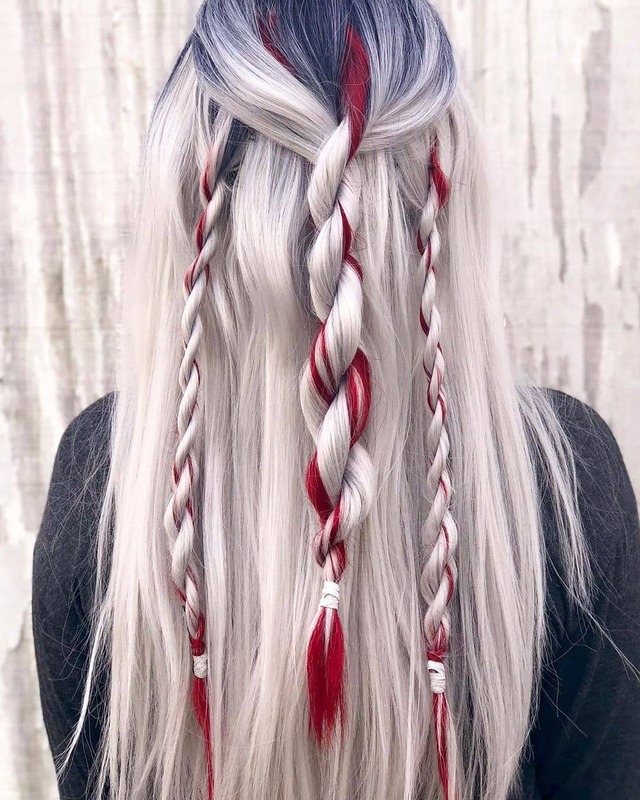 The red balayage is trendy ox-blood, which creates fabulous patterns in the rope-braids draped down the back. 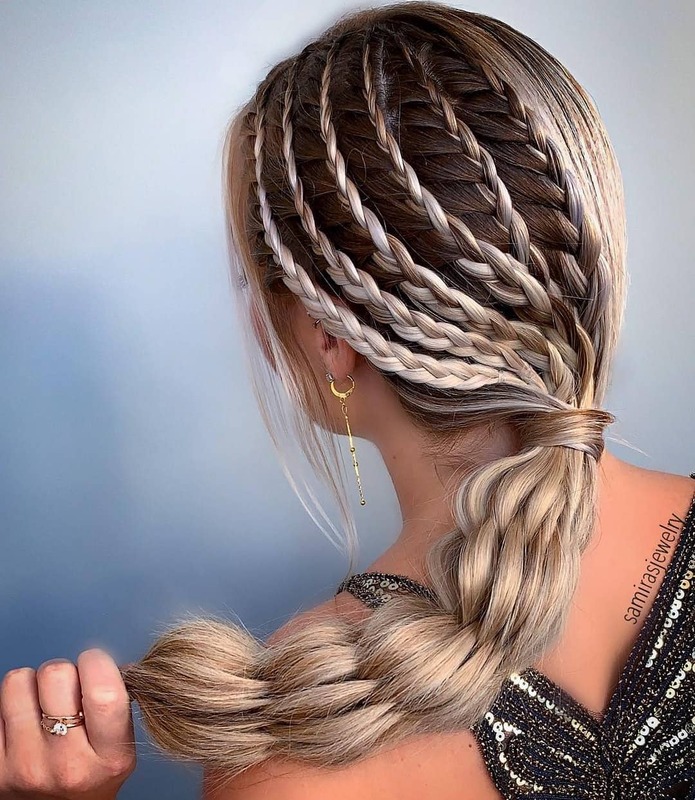 This semi-formal braid hairstyle is full of high-fashion features. Six vertical braids create attractive dual-textures on one side of the head giving a trendy, asymmetrical vibe. And the colorist has beautifully highlighted these with oat-blonde balayage. 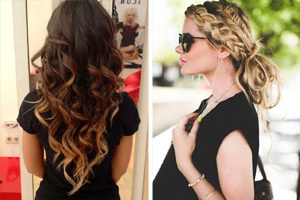 The lower lengths are soft, honey-beige blonde woven into a fabulous, new double-braid that has all-round puffy volume. This loosely-plaited messy braid is perfect for a summer party or a semi-formal wedding hairstyle. The oat-blonde hair-color is softer than platinum, and with pretty pink toner has a lovely, romantic vibe. For a summer party try plaiting in a brightly-colored silk scarf. And for a bridal hairstyle, add pretty, floral hair accessories to the links for a ‘country-bride’ look! 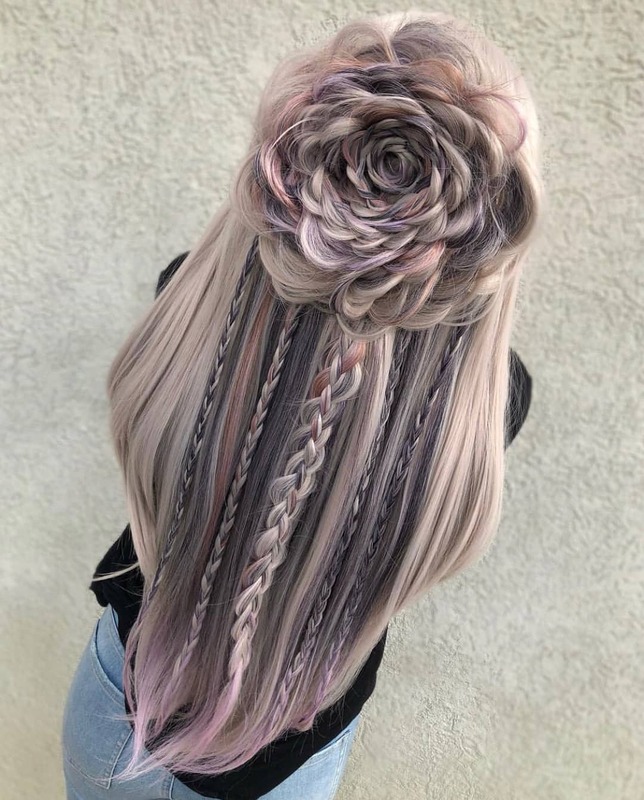 These three, loosely-plaited, fishbone braids create impressive volume and gorgeous texture at the back of this long party hairstyle. The base color is ash-white blonde with a shell-pink toner and raspberry-pink balayage. 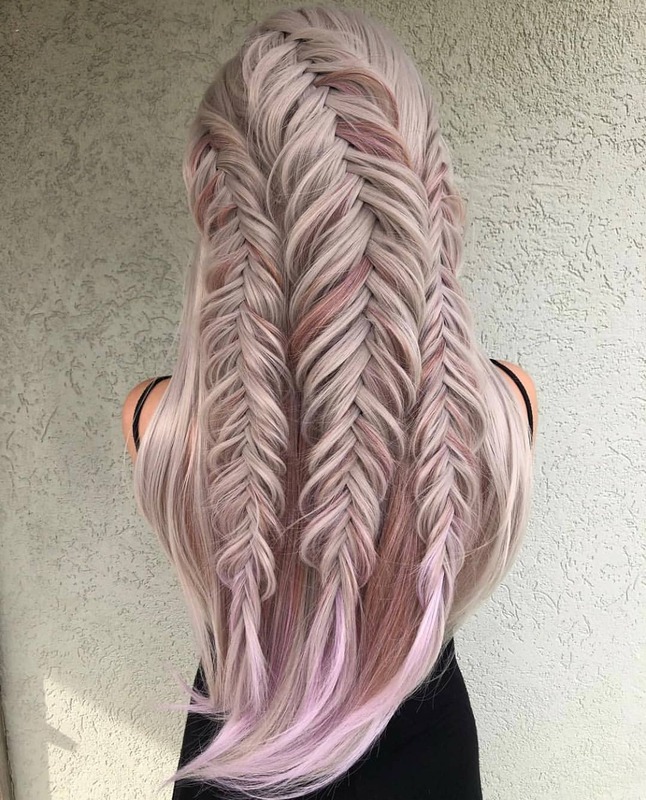 The swooping V-shaped back, with a lavender-pink ombré, adds a final touch of cuteness to a fun, feminine braid hairstyle. So whether you want a special casual braid for weekend outings, a show-stopping party braid or an original bridal look, I’m sure you’ll find the perfect braided hairstyle here!